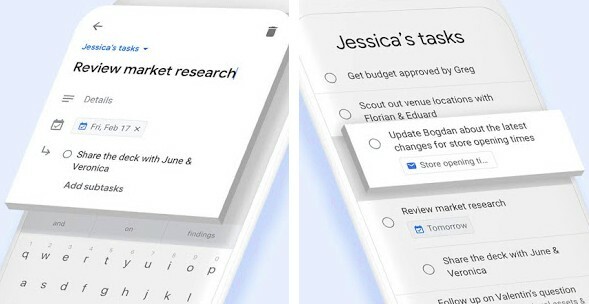 Freely available for both Android and iOS devices, the brand-new Google Tasks mobile app simply provides another way of adding tasks from the other G Suite apps without using the task management features of Google Calendar or Gmail. For now, this app is quite basic and lacks many of the features found in products like Evernote, Todoist, or Google Keep. When it comes to task management, Google allows G Suite users to add tasks to Gmail and Google Calendar, but also provides the very popular Google Keep app for both Android (over 100,000,000 downloads) and iOS (only ranked 48th in the Productivity section of the App Store, unfortunately). Now, Google Tasks comes as a standalone app for those who wanted such a tool. The Google Tasks app is currently in an early stage, so many features are still missing. Unfortunately, this also led to a rather low Google Play score - 3.5 out of 5 after receiving 1,698 ratings. Since Google Tasks is a part of the popular G Suite set of apps, it can easily manage tasks created in Gmail or Google Calendar, and more. Other than the basic creation of tasks and their management, there's not much to do in Google Tasks for now. Although the users enjoy the design and minimalistic approach, Google should add a dark mode, Google Assistant and Google Keep integration, the ability to swipe tasks left or right to gain quick access to various options (similar to Microsoft ToDo or TickTick), and more. To get a better idea of what to expect, take a look at the video below. Google Tasks is freely available for both Android and iOS users and has no special requirements — it works on iOS 10.0 or later and Android 4.1 Jelly Bean or later.